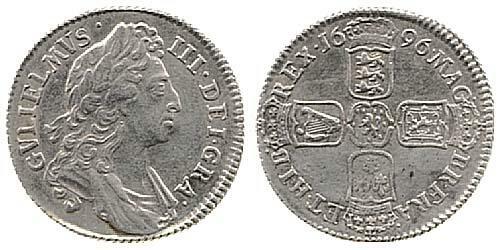 The Great Re-coinage of 1696 was an attempt by the English Government under King William III to finally replace the hammered silver that made up most of the coinage in circulation, much of it being clipped and badly worn. This was something that Charles II and James II needed to do but both had failed to do. 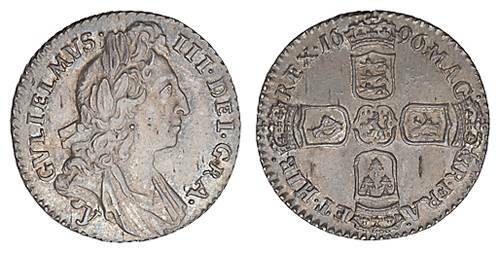 Firstly, hand-struck (hammered) silver coins from prior to 1662 had been clipped around the edges and thus their intrinsic value (weight) had been reduced so much, that they were no longer a viable tender, especially abroad. New Acts of Parliament were passed in order to create the Bank of England and protect national military security. This situation also triggered William Lowndes of the Treasury to ask the warden of the Royal Mint, Isaac Newton, for help. An example in the 1690s would be to clip silver coin, melt it into bullion and sell it on the Continent for gold coin, where silver fetched a higher price than in England. This gold coin would then be shipped back to England where the Royal Mint was paying a higher price for gold than other countries. This gold would be sold to the Mint for silver money and the arbitrager would make a profit. The result would be a shortage of silver coin for local commerce and an over-supply of gold. Branch mints were established at Bristol, Chester, Exeter, Norwich, and York to assist with the work of re-coinage. In just five years (1696-1700), the value of silver struck was £5,106,019 compared to £3,302,193 coined in the preceding 35 years. However, the re-coinage was not a financial success. Gold coins were flowing into the mint while silver coins were flowing to the commodity markets. England eventually committed itself to a gold standard. The only way to maintain silver as coin was to reduce the silver content so that the coin’s nominal value was more than the bullion of the same weight. There was no UK in the 1690’s. Act of Union with Scotland was effected between 1703-07, so no Great Britain in the 1690’s either. In fairness, all 3 kingdoms were affected but England suffered most since its silver coins were of good standard – Ireland had no silver coins of its own, so the Irish economy worked via a mixture of foreign silver and gold coins (incl. English). James II tried to get this specie in 1689 but the Irish held on to their silver and gold coins, so he issued the first ‘fiat’ currency in the world – gunmoney ! At the union of the crowns in 1603 the Scottish pound was fixed at only one-twelfth that of the English pound. The Parliament of Scotland of 1695 enacted proposals to set up the Bank of Scotland. The bank issued pound notes from 1704, which had the face value of £12 Scots. Scottish currency was abolished at the Act of Union, the Scottish coin in circulation was drawn in to be re-minted according to the English standard.